The fall season is one of the best times of the year to enjoy the outdoors in Northern Virginia. 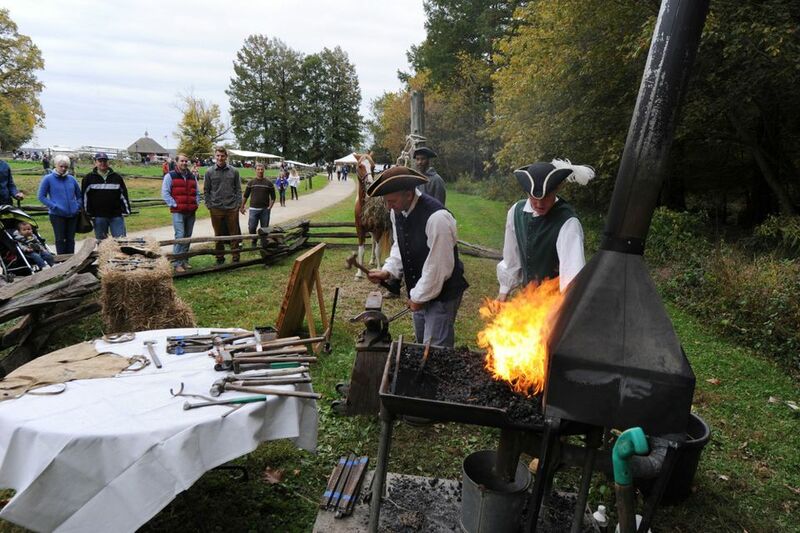 As the temperatures drop and the leaves begin to change colors, families enjoy a variety of festivals with activities ranging from pig races to pie eating contests to scarecrow-making to colonial reenactments. Enjoy the change of seasons with some family fun at these top events. The annual Cox Farms Fall Festival in Centreville runs from September through November. The farm is located on more than 90 acres, and the festival features a pumpkin patch, giant slides, hayrides, rope swings, farm animals, corn mazes, straw tunnels, goat village, apples and cider, and lots of entertainment. Cox Farms Fields of Fear is a haunted trail with lots of scary Halloween activities over 20 acres. This is one of the largest fall festivals in Virginia. Great Country Farms in Bluemont celebrates every season, but the month-long Fall Pumpkin Harvest Festival is a big favorite with locals and visitors alike. The annual festival begins at the end of September and runs through Halloween. The festival features pick-your-own pumpkins, a corn maze, and P-Rex the pumpkin-munchin’ dinosaur. Pick the winner in the Oinkintucky Derby Pig Race, take a photo with the Pumpkin Princess, or shoot pumpkins from a cannon. Held on the first weekend of October on George Washington's Estate and Gardens at Mount Vernon, this festival features wine cellar tours and live music on the grounds of the home of our first president. The estate offers gorgeous views of the Potomac River, and the fall season is prime time to sample local wines, listen to live blues and take an evening tour of the Washingtons' home. Advanced tickets are required. The Waterford Fair is a traditional American craft fair with juried artisans from all over the U.S. participating. This annual fair in Waterford includes hands-on demonstrations by more than 150 artists, live music and dance, Colonial and Civil War-era ​re-enactments, a tour of private historic homes, parades, kids activities, and more. Once a year, usually on the first Saturday of October, the Smithsonian Biology Conservation Institute, is open to the public to offer a behind-the-scenes look at the National Zoo's world-renowned science, research, and animal care. Visitors can interact one-on-one with scientists and learn about their fascinating research. Admission to the festival includes behind-the-scenes looks at endangered animals, live music, and special activities for children. The event is held rain or shine in Front Royal. This annual autumn event in Fairfax​ includes more than 100 interactive activities and exhibits for the whole family. There are train rides, a kids' climbing wall, a pumpkin patch, hayrides, a petting zoo, and dozens of children’s performances. You can even make scarecrows. All entertainment and most programs are free; some activities require a minimal fee. The historic town of Manassas hosts this annual family-friendly festival to celebrate fall with live music and entertainment, handmade crafts, and a variety of foods. Enter the pumpkin pie baking contest or try to win the pie-eating contest. Take a beverage break in the Beer and Wine Garden. Dozens of breweries feature their best American-style beers at this annual October event in Bull Run Park in Centreville. Entertainment includes live music by local bands and children’s activities like face painting, airbrush tattooing, moon bounces, and rock climbing. And of course, there's lots of beer—more than 40 American breweries are represented. Visit Mount Vernon, George Washington's Virginia estate, in late October and enjoy a variety of 18th-century fall activities including horse-drawn wagon rides, wheat treading in the 16-sided barn, a straw bale maze, early-American games, music, and blacksmithing demonstrations. Held rain or shine; advance ticket purchase is suggested. Downtown Rosslyn hosts this festival to celebrate the finish of the running of the annual Marine Corps Marathon. It's a short walk from the finish line at the Marine Corps War Memorial. This family-friendly festival offers a wide range of activities, including live music, food, and giveaways. Runners meet their friends and family to enjoy music and refreshments at the beer garden and Rosslyn’s Restaurant Row.